Malgré lui is one of those damnable French expressions that, like les misérables, has no simple, convenient translation into English. It may be explained something like this: “Persons X have become something (a physician, perhaps); they had no plans along these lines, and actively worked against this happening, but it happened anyway, and they discovered that there wasn’t a [deleted][deleted] thing they could do about it.” This would hardly fit into a Twitter post (an old-school one, anyway), never mind a blog title. So Your Friendly Neighborhood Amoeba requests that you will, ah, pardon his French. The mass media and Your Friendly Neighborhood Amoeba have always had a difficult relationship. Especially the visual media: movies and television. Television! 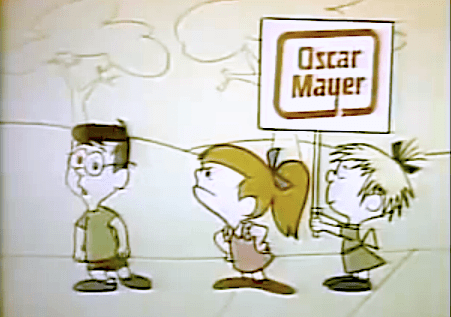 The “Plunderer’s March” from Mr. Magoo’s Christmas Carol would send him under the couch. Every time. And would then be the stuff of nightmares for weeks on end. Alternating with the ones featuring bells and sirens that tolled imminent nuclear destruction. (Alarm clocks in YFNA’s bedroom had [ahem] alarmingly short lifespans.) Yeah, the first date was rocky, and despite Bullwinkle’s best efforts, things went downhill from there. And when the thug plugged the other guy in the eye, through his glasses, near the end of The Godfather, it was o-ver! YFNA already had enough trouble with anxiety attacks without paying billionaires to induce more! This kid (we’ll call him Chuck; he doesn’t seem to have been given a name in the commercial) has not (yet) been pressed into Ms. Smyth’s gang, and has the freedom to think independently. As well as the wit. He is, after all, the only one in the picture who is wearing glasses. Clearly, he’s a nerd, and this was way before nerds were millionaires cool. His reasoning is more scientific, based on his analysis of the data. Probably, the data included various picnics and cookouts in which he had participated, in which he had loved his hot dogs to death. Perhaps he even gave a thought to data associated with their afterlife, when the hot dog remains were seated, however briefly, on the porcelain throne. The conclusions of Chuck’s scientific analysis are diametrically opposed to those of Sandra Smyth’s motivated reasoners, and he consequently marches down the street in the opposite direction, proclaiming that he’d hate to be an Oscar Mayer wiener because “there would soon be nothing left of me”. Alas, unlike the fixed conclusions of motivated reasoners, those of scientific reasoners are tentative, and subject to modification upon receipt of future data. For Sandra C. Smyth and her gang catch up with Chuck and make it instantly clear that “nothing left of me” is no longer something he can avoid. He can join the gang and be consumed later (and perhaps with compensation to his next of kin from Oscar Mayer), or resist and be wiped out now. He marches off, singing “I’d love to be …”, with Smith watching his every move. Kinda like being caught in a world where you march with the Daily Kos and John Stewart, or with Right Wing News and Rush Limbaugh. Or else. Where all reasoning is motivated. Or there will soon be nothing left of you. (**)Many, many years after YFNA should have known better, he was looking at a German-language map of Austria, and wondered aloud, “where the hell is Vienna?” A more knowledgeable, and probably much younger (YFNA is hazy on the details – as, he understands, is typical for memories of trauma), colleague sighed and pointed to the largest, boldest letters on the paper, which prominently spelled out WIEN – pronounced, as YFNA was shortly, and curtly, informed, “VEEN”. YFNA can only assume that a person trying to say “VEEN” to an American coughed while doing so, and that’s how come the American got “Vienna” out of it, and then it went viral. Something “wiener” (adjective) is something “from Wien (Vienna)” – for example, Vienna sausage, or wiener Wurst. You’d best believe that American advertising agencies got that Wurst out of there, and turned “wiener” (with a W) from an adjective to a noun, cat-quick. Which probably suited the wiener Mensch down to the ground, appreciating the smallest possible association between American hot dogs and quality Austrian sausages. This entry was posted in Amoeba's Lorica, personal thoughts, We the People and tagged 1965 Oscar Meyer wiener ad, bullying, motivated reasoning, Plunderer's March, Vienna, vienna sausage, visual mass media. Bookmark the permalink. In my frank opinion, this is an excellent post. Oscar Meyer is rolling over in his grave. Despite its best attempt at being a damnable French expression, malgré lui is merely an adverb. Which one(s), Karen? There were three of ’em … Prepositional phrase used as an adjective. Tweet, tweet, tweet — 140 characters.